When he was teaching at Buffalo State, Frederick Howe, professor emeritus of educational foundations, was committed to connecting with the community in meaningful and lasting ways. He created the college’s Community Service Day, which the Volunteer and Service-Learning Center (VSLC) took over when he retired in 2007. Now he and his wife, Marilyn Howe, ’77, a retired educator, have established two four-year scholarships for full-time incoming first-year students beginning this fall. The scholarships are designed for Western New York students who participated in community-service projects in high school and who are committed to continuing community service work as college students. The first Frederick and Marilyn Howe Community Service Scholarship requires residence in the city of Buffalo and qualification as a “Say Yes” student from a Buffalo high school. The second Howe scholarship is designated for graduates of high schools outside the city of Buffalo in Allegany, Cattaraugus, Chautauqua, Erie, Genesee, Niagara, Orleans, or Wyoming County. Both scholarships require that students be enrolled as full-time (at least 12 credit hours each semester) incoming first-year students at Buffalo State; have a minimum high school grade point average of 85; have demonstrated at least 80 hours of community service throughout high school; and have completed the Free Application for Federal Student Aid (FAFSA). The first scholarship will cover the mandatory costs to attend Buffalo State other than tuition, up to $2,000. The second scholarship will cover the remaining balance of the cost of attendance after state, federal, and institutional aid are subtracted, up to $8,000. Frederick Howe joined Buffalo State as a faculty member in the Educational Foundations Department in 1973, a year after completing his Ph.D. at Michigan State University. 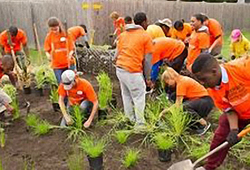 In addition to his faculty responsibilities, Howe coordinated Buffalo State’s participation in the Great American Cleanup and spearheaded other volunteer and community outreach activities, including Community Service Day. He received the Chancellor’s Award for Excellence in Teaching in 2001. Marilyn O’Hara Howe graduated from Buffalo State in 1977 with a master of science in elementary education and spent her professional career as a teacher with the Buffalo Public Schools.